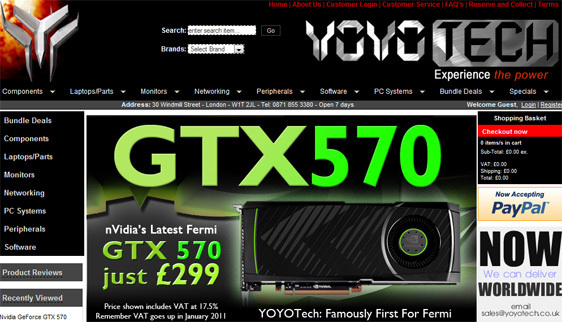 British Computer Shop YoYo Tech advertise on its front page the yet unreleased NVIDIA GeForce GTX 570 graphics card, with a priced tag £ 299 (350 euros). The product does not yet exist in stock, but you can already pre-ordered it . the Product page GeForce GTX 570's specification listed is 732 MHz clock speed for the GF110-graphics chipset and 480 CUDA kernels, 1280 MB of GDDR5 memory running @ 950 MHz (3800 MHz QDR) clock rate. the Top product images are not real photos of GeForce GTX 570 graphics cards.